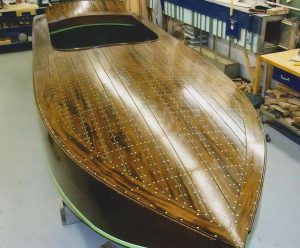 Dixie Baby, a famous 1920’s 24ft race boat has recently undergone a one and a half year restoration at Breen Boats in Rockwood Ontario. She is likley the finest boat out of any shop in many years, because of her racing history, her originality, her engine and the science behind her hull design. In 1928 Dixie Baby won the Webb cup; which meant winning three consecutive races. This feat was unheard of at that time because most boats were built very lightly and mechanical problems weere not uncommon. She also won the Richfield Oil Cup. Dixie Baby was built in 1921 with mahogany planking and brass screws, giving her deck a very distinctive sparkling effect. Coupled with large direct exhaust pipes off her 220 hp Hispano Suiza engine mounted to a forward V-drive , her engine roars like an aircraft engine from 95 years ago. She will be a pleasure to hear and watch when she embarks on her seven city tour, culminating in September at the ACBS International meeting on Lake Tahoe. A fascinating feature of Dixie Babe is the Ventnor step hull design in which the last eight ft of the boat bottom is raised approximately 4 inches higher than the rest of the boat bottom. This step, in conjunction with the external rudder and prop setup actually worked very very well as seen in the photos in the video below. This design enabled the boat to literally rise out of the water and run on almost on air…. the boat is actually riding on a cushion of air/water, which results in the boat attaining fantastic speeds. Dixie Baby’s very rare 220 hp Hispano Suiza engine was totally rebuilt by Robert Mishko of Tennessee. (This rebuild took over a year!) The video below includes shots of the engine totally disassembled, the engine line drawing, and the rebuild installed in the boat. Keep in mind that all the side and transom wood work is original. The transom almost ends at the water line. The boat bottom and sides are copper riveted, as they were when the boat was originally built. 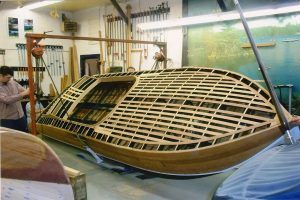 Every detail on this boat was reproduced as it was originally built. The boat engine compartment and the deck undersides are beautifully finished. Enjoy the pictures from the Rosenfield Collection that are also intermixed with photos of Dixie Baby in various stages of her restoration. (Linl below. Give yourself some time to enjoy this tribute to a fine boat and the great stewardship of a member of the Canadian Motorsports Hall of Fame; Lorne Leibel. Thank-you for restoring a great racing boat.